In 1841.2 W. Arnaud & Sabatier ascended White River 500 leagues above Kartoum to 4'42' N. Lat. thus passing the parallel of the supposed Mts. of the Moon without seeing anything but Marshes and Low Land. Names numerous tribes and caravan routes throughout. Surrounding watery areas show the routes taken by numerous sailing expeditions sailing around the Cape, including Cook, Carteret, Wallis, the Resolution, Byron, Vasco de Gama, Vancouver, and others. An inset details the remote island of St. Helena, famed as Napoleon's place of exile and death. Lower right hand quadrant features two attractive vignettes depicting Cape Town and Table Mountain and Port Natal. 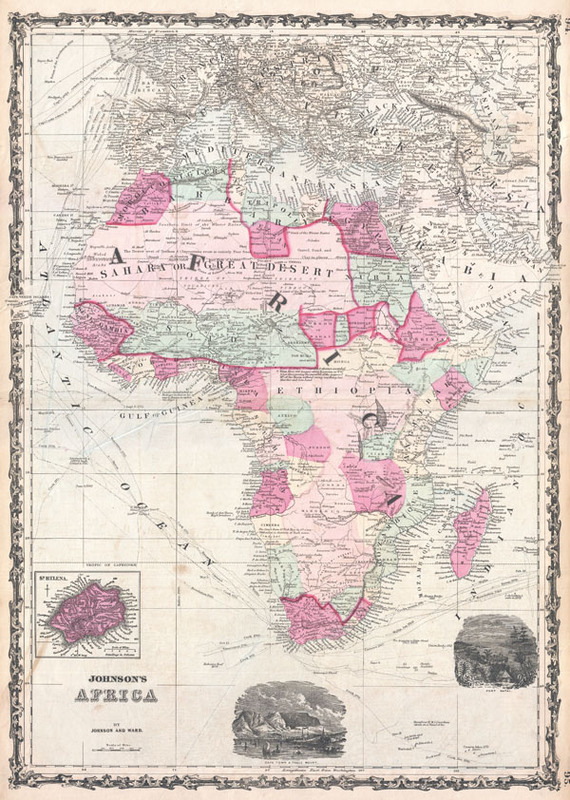 Features the strapwork style border common to Johnson's atlas work from 1860 to 1863. Published by A. J. Johnson and Ward as plate number 65 in the 1862 edition of Johnson's New Illustrated Family Atlas. This is the first edition of the Family Atlas to bear the Johnson and Ward imprint.